Although macaws are not native to the American southwest, they are an integral part of Zuni culture. The Macaw Clan is one of the sixteen clans of the Zuni totemic system considered the all-containing central or mother clan. Macaws and other birds have great symbolic significance in many areas of traditional Puebloan life, and, until 1946, a live macaw was kept for the benefit of its feathers. Cushing reports that most of the significant leaders of the Zunis come from the Macaw Clan. 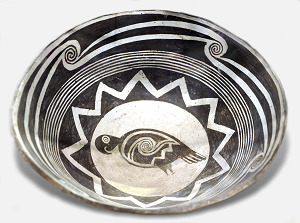 "Mimbres pot depicting a macaw" by Andreas Praefcke is licensed under Public Domain. 1896. “Outlines Of Zuñi Creation Myths.” Thirteenth Annual Report Of The Bureau Of Ethnology Of The Smithsonian Institution 1891-’92. Washington, D.C Government Printing Office.